The old GOES-East satellite, also known as GOES-13, was launched to orbit in 2006. It had been providing us with satellite imagery for North and South America. Over time, older satellites need to be replaced due to limited fuel and reliability issues, and also to make way for new generation satellites that have enhanced data acquisition technology. On January 8, 2018, the data transmission from the old GOES-East was finally replaced by the new GOES-R (GOES-16). The Solargis team finalised development activities and concluded a smooth transition to the new satellite. The changes in the data acquisition and model processing bring a lot of new value to our customers. Spatial resolution of satellite imagery used in the Solargis model has been increased to 2 km (at the sub-satellite point). The new data also has better geometrical stability. These updates improve the model accuracy in coastal zones, mountains, and complex geographies. Solargis data calculated using satellite imagery from GOES-R satellite are available from period starting January 1, 2018. 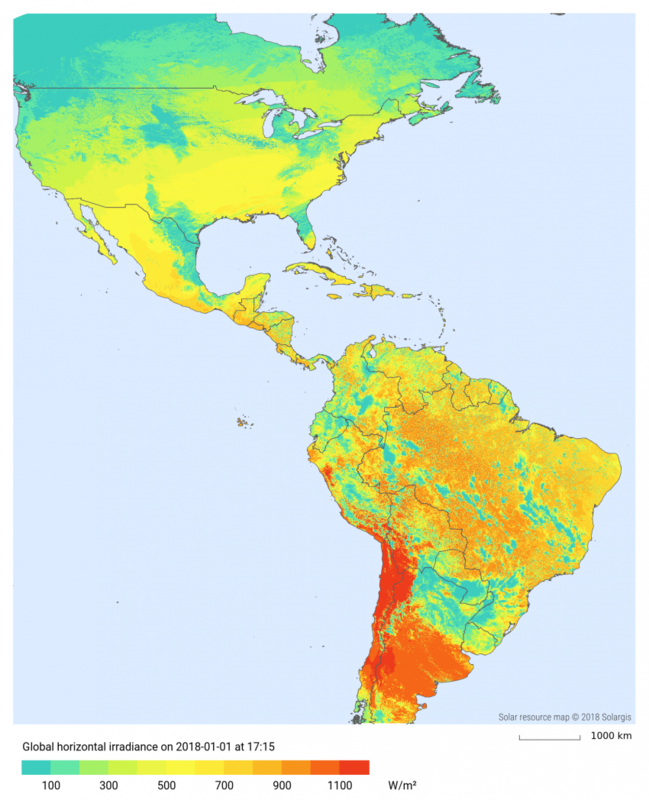 The implementation of the new satellite data and updated Solargis model for Americas will increase the accuracy of solar resource data, and will also speed up the time of delivery. The model will go through further improvements in the year 2018 as more data from the GOES-R satellite becomes available. With the planned updates and re-design of data management, nowcasting services will be re-launched also for Americas within next months.